Join us for an extraordinary opportunity to train in the Harambee Arts methodology with its creator, Gloria Simoneaux. You will be working alongside long-term local staff who have devoted their lives in direct service to individuals impacted by extreme poverty, HIV/AIDS, incarceration, trafficking, violence and other traumas. The first week you will travel to Nanyuki and stay in luxury tents at the foot of Mt. Kenya where you will receive four days of intensive training in our unique methodology. In Nanyuki, you will go on safari and see elephants, lion, rhinos and other wild animals at Ol Pejeta Conservancy. 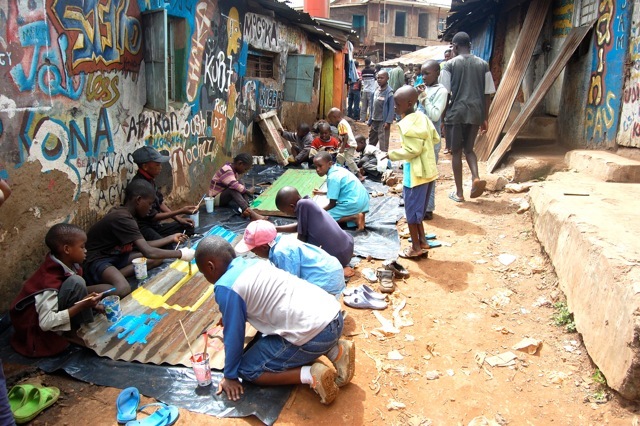 During the second week, you will share the intimate experience of visiting and participating in Harambee Arts projects in the Kibera slum, at a school for children with autism and other special needs in the Mathare slum and at the Langata Women’s Prison, working with HIV+ prisoners. You will experience the phenomenal healing power of the Expressive Arts and the long-term success of Harambee Arts staff of 12 who bring joy and love into the lives of severely neglected communities. In Nairobi, participants will also have opportunities to meet with Kenyan therapists to discuss the issues and challenges of supporting children in Africa. Six nights at Kongoni Camp. Located 2 km from Nanyuki Town northwest of Mt. Kenya, Kongoni Camp offers fully equipped modern facilities, stunning natural beauty, heated swimming pool and access to game parks and mountain hiking. Costs reflect single occupancy rooms and full board. Seven nights at Lotto Inn and Suites in the Westlands area of Nairobi. Spacious, comfortable rooms located near upscale shopping areas and restaurants. Costs reflect double occupancy rooms with half board. Single occupancy is also available at a higher rate. Contact us at Gloria@harambeearts.org for an application. on the morning of September 15. Full itinerary available upon receipt of application. A $2,400 fee for the 15 days includes all lodging in Nanyuki and Nairobi, full board in Nanyuki and half board in Nairobi, airport transfers and all local transportation in comfortable, air-conditioned vans and buses, safari in Nanyuki and excursions in Nairobi. Not covered in the trip cost are: international airfare, visa ($50), medical and evacuation insurance, alcoholic beverages, tips and other incidentals. Participants are required to purchase medical and evacuation insurance.